At “Hosodono”, a new sign of “Eto” (Chinese zodiac) is displayed. The clear stream of Myojingawa. 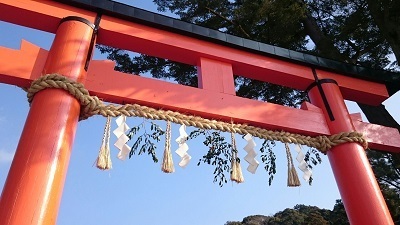 Beautifully arranged “Ni-no Torii (The Second Gate)”. 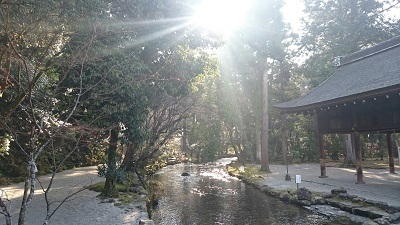 Today, the staff of LST Kyoto, LST Tokyo and Furniture shop “LST BOTAN” altogether visited Kamigamo shrine. 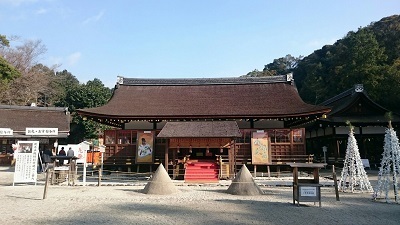 After completed a big event of every 21years “Shikinen-Sengu” last year, the premises was filled with a holy atmosphere. We were specially allowed to attend the prayer right in the center of the main sanctuary. We once again recognized the fact that we are planning the wedding ceremonies to be performed at such a historical place and working as a publicist for the shrine. “Please do your best with your nice smiles this year too”; the warm words of people from Kamigamo shrine encouraged and motivated us a lot. At the beginning of the year, we would like to refresh ourselves and make a good start to work. We appreciate your continued support for this year.